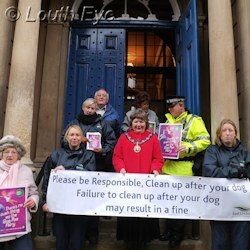 Councillors and other interested groups got together to launch "Not on my street", a campaign against dog fouling. 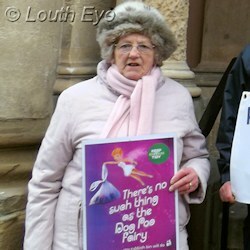 This campaign unites local organisations including Louth in Bloom, the Town Partnership, the police, and the council. They got together on Monday morning for a tour of the town and some of the streets that are worst affected. According to press officer James Gilbert this is the single biggest complaint they receive at ELDC. Recent snow has certainly highlighted the problem. "My grandson got absolutely covered when he was sledging," said Councillor Phil Sturman. 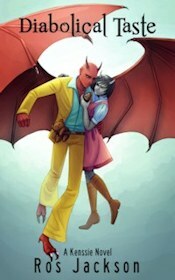 The good news was, during the tour Rosemary Lane was clear of mess. 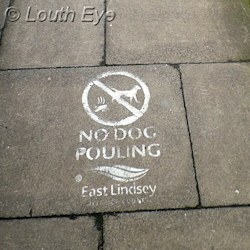 It's one of the areas that has a "no dog fouling" marking. These markings wash off eventually so they don't harm the pavement, but there are quite a few of them around town. Unfortunately the same couldn't be said for the area between Northgate and the Co-op, which was even worse than the picture indicates. That's where the wardens start off their daily patrols. 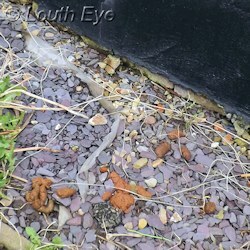 Failing to clear up after a dog carries a fine of �75, and prosecutions do take place. However people are being urged to report incidents and rather than confronting individuals, for their own safety. Dog wardens need a description of the owner and the dog. If you see something like this, report it to the District Council on 01507 601111 or email dog.warden@e-lindsey.gov.uk.